When I have a difficult subject to discuss, I sometimes like to start off with a graph to visualise my ideas and the complexity of the subject. The first draft of this one was hand-made. I did it during a discussion I had with teachers about choices of ICT equipment, systems and applications. I argued that you need to have a sound framework for ICT decision-making in education. Any choice that you can make has multiple reasons and consequences. 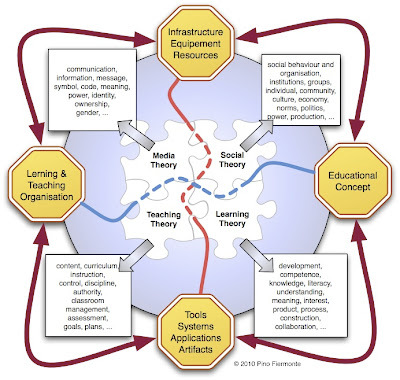 Decision about ICT in education are always – consciously or unconsciously – based on a theory about and a vision on learning and teaching, media and society. Most of the time people are not conscious about their own theories that are guiding their choices and they rarely have a realistic idea of what effects of their decisions will have on learning, teaching and school organisation for instance. If you are in favor of a computer lab you have a different view on learning organisation and learning processes than if you prefer distributed equipment. The same is true if you expect a wireless laptop cart to be the best solution for using ICT with your students. 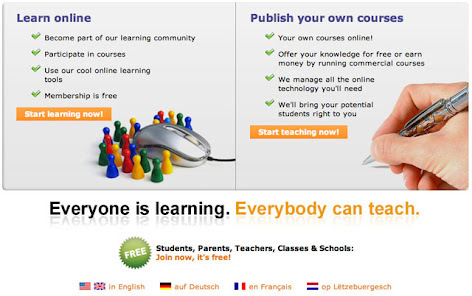 If you think you need specialised educational software you probably also have a different view on learning, literacy, instruction and teaching than if you prefer production-oriented software with no predefined content. In case you have a limited budget for equipment, the decision to spend it on interactive whiteboards says something about your teaching concept. It probably differs from the concept someone has, who would prefer to spend the same amount on computers with free software, cameras, camcorders, digital microscopes or robotics sets first. The second fosters simultaneous and autonomous hands on activity by many, the first promotes centralized lecture style activity of one at a time. Most decision makers have hardly an overview on the short term and long term effects of the decisions they make. Some effects are purely financial or technical. Of course they ought to be considered even if for the moment your budget is big enough. Some effects are organisational. A computer lab for instance is fine, if you don’t use computers on a daily bases. If the classes who use it are few and if you are near to the lab, you can use it whenever it’s free. If every teacher wants his time share for using the lab and if there are many teachers and classes, they will have access once a week or once every two weeks. If at the assigned time a technical or organisational problem comes up, you will have to come back two weeks later – unfortunately that’s when you had planned your field trip. The same logic applies to mobile systems like laptop carts. The most important however are the effects on teaching and learning. Do the invest in ICT serve old ideas with new means or are your invests a stepping stone to new educational practices? And, what else is needed to implement new educational practices? As an educational ICT consultant I have experienced that teachers' views are often guided by considerations of high availability (for themselves and for today), handling, short term productivity, control, fast familiarisation, and technical modernism. Schoolboards and politicians are focused on costs and social equity, but sometimes, if the salesman has good convincing skills, their hunger for modernism overwhelms their decisions, with the consequence that costly hype equipment is bought without any noticeable effect on education. Technicians mostly concentrate on reliability, efficiency, maintenance and standardisation, but are also driven by ideology and by the option to take control over the technology and the users. Architects are generally concerned about budget limits – if equipment is part of the project package – about design issues of cabling and computer furniture. 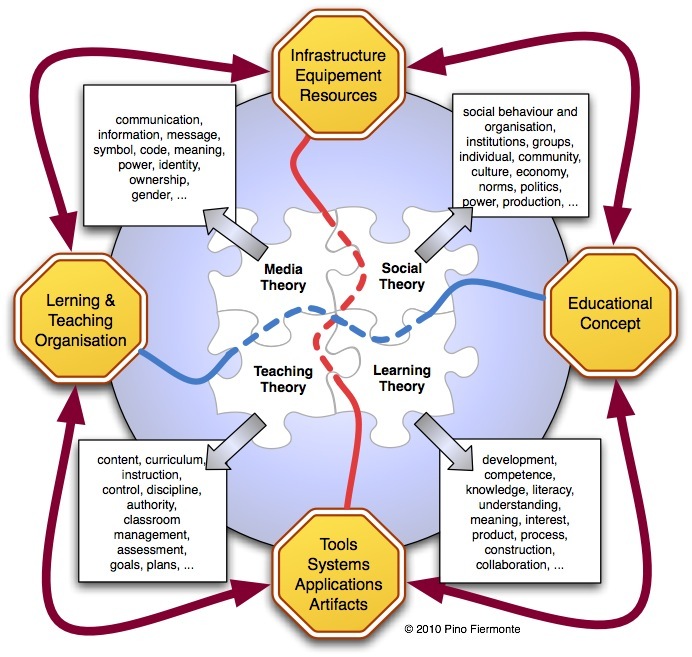 In the end what is lacking is a sound framework connecting teaching, learning, equipment and software to guide people to choose from all the options that are available. Which is the dominant learning and teaching style in our school today, and where do we want to go from here? Which technological strategy will help us develop our school? Which are the competencies that our students really need to develop, when we consider that they are three, eight or fifteen years from entering the job market or playing an active part in social, economical or political “adult” life? Which are the competencies that teachers need to develop in order to serve as guides or even role models for their students? What are the implicit and explicit “messages” to the learners and the community, of the different hardware of software solutions that schools can choose from? Are students treated as responsible autonomous learners or are they vessels to fill with information that is expected to morph into knowledge? Do we talk about standards to the learners meaning specific software that “everyone” uses in the office, or do we talk about standards in the sense of information management, communication, non-linear production processes and so forth. Are ethics, authorship and empowerment important aspects of schools considerations, and are they connected to technology, or are technological resources seen as value free “tools”? Is the learner in control of the machine or is the machine in control of the learner? And who controls the machine that controls the learner? Such questions are never left unanswered even if they are not raised. At least the answers are hidden in the choices schools make regarding hardware, software and distribution of technology. At times where choices have to been made, my graph doesn’t necessary simplify the task but it helps to critically analyse possible scenarios and describe the interconnectedness of some major layers that maybe considered.